A local volunteer group had been caring for the horses, locked in a field in Dungarvan, since last month. Two of the horses involved. VOLUNTEERS HAVE BEEN given two extra days to save eight horses which were due to be put down this evening. However, they still must raise €2000 to save the animals. The group had been looking after the animals for several weeks after the horses were left without food or water. They say that the original owners are attempting to reclaim two, but that a fee of €500 per animal had been requested by a pound in Cork for the release to volunteers of the eight other horses, now reduced to €250. A separate group, Charlie’s Equine Rescue, negotiated this evening’s extension on the euthansation of the horses. “We have a horse lorry ready to go but no way of raising the money,” a volunteer who had been looking after the horses told TheJournal.ie. It is unknown what happened to another five horses that were with the group impounded. The 15 animals, ranging from trotting horses to Shetland ponies, were being kept in a field close to an industrial park in Dungarvan, Co Waterford, and are said to have been neglected by their owners. Each had been badly affected by worms and had scars from head collars. They also were not provided with any fresh water. A local volunteer group, No Cull – Saving Ireland’s Horses, had been feeding and looking after the horses for some time. Speaking to TheJournal.ie, one of the volunteers described how they had arranged for food and medical treatment for the animals through local donations. “We had asked around for donations and managed to get some hay and wormers for the horses,” they said. Their condition had started to improving after being fed and wormed, the volunteer said. 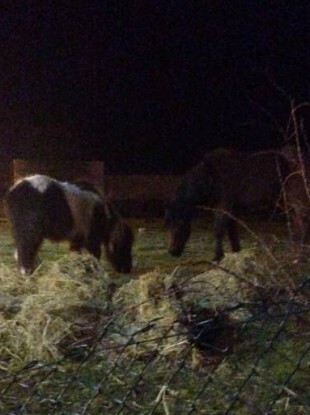 They said the horses were believed to have been abandoned, having been neglected but were securely locked in a field. However, the group believes that a gate to the enclosure was opened on Friday morning and the animals let out loose onto nearby roads. Animal services were called and the horses taken to a pound in Cork. “All the animal shelters we’ve called say they’re full up or can’t afford them”, they said, “but they are a group of horses that could easily be rehomed”. The volunteer said most of the horses are trained and comfortable with humans. Those who wish to donate are asked to contact charliesequinerescue@yahoo.ie. The identity of the volunteer quoted is known by TheJournal.ie. The animal pound involved has been contacted for comment. Email “Update: Volunteers have two more days to raise funds to save eight horses”. Feedback on “Update: Volunteers have two more days to raise funds to save eight horses”.